I’ve added photos of the FS-52 spark conversion. I haven’t flown it yet, but expect to run and fly the engine in a few days. I expect it to run well. I have learned that the RCEXL ignition will operate well past 8,000 RPM and the 10,000-11,000 RPM I expect to run at will be no trouble at all. I’ve been able to get some flying time in this summer. I put a few hours on an Enya 46-4C II with spark ignition. It has a CH Ignitions system installed. I bought it online at auction. It’s old, there was a note written in the box, “Run 6-28-88.” It uses the mechanical timing advance arrangement. I had some trouble tuning the engine initially, but it must have not been broken-in fully. After a couple hours of running it smoothed out, runs, and tunes well. I’ve been running varying percentages of castor oil (Maxima Castor 927 or Klotz Benol) or Klotz Original Techniplate with either straight methanol or E85. The E85 runs well, just a few hundred RPM down from methanol. I’m tempted to raise the compression ratio to increase performance. Another project is an OS FS-52 spark conversion. It will have an RCEXL spark ignition. I see these systems are rated to 8000 RPM, so I’ll see what happens above that. They require a 1/4″-32 spark plug boot with resistor to be installed as they are supplied with boots for 10mm or 14mm plugs. 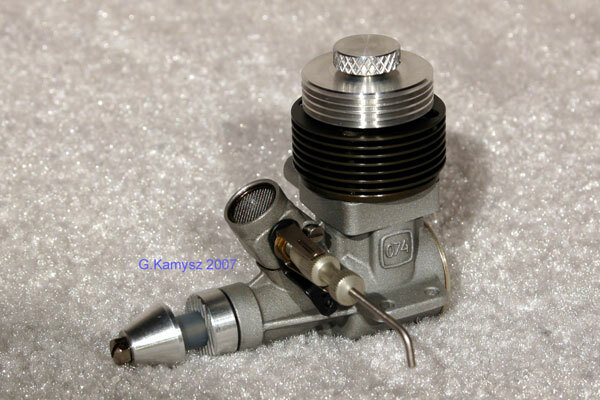 These ignitions are mainly used with large 20+cc gasoline engines. The engine is also receiving a positive crankcase ventilation system like OS uses in the new FSa series. I hope this will keep the oil mess down and allow me to reduce the oil content in the fuel. I made a gasket for he rocker cover and sealed the backplate with anaerobic sealant. I also intend to try this engine with E85, and after some runtime will increase compression ratio to see if any power can be gained. Diesel four stroke projects continue. I’ll be adding the crankcase ventilation system to my FS-48 along with a few other parts to freshen it up. Again, I hope to be able to reduce oil content in the fuel from the 10% I’m currently using. I hope to test fly the FS-91 in the coming weeks. The engine has been waiting since fall of 2007. I am also contemplating the OS FS-120 diesel conversion. If the .91 runs well on the airplane, I’ll try converting the 1.20. I’m short on time right now, but am in the process of replacing my lathe with something a little more stout. I’m also searching for some tooling. In the mean time I’ve decided to do some testing with E85 fuels and glow ignition. It seems some have had good luck running E85. Running E85 with a glow plug would be a much easier conversion for modelers than the diesel conversion. As winter grips Chicagoland I’m not able to do much testing of engines. It’s R&D season. I’ve added a few books to my library and found some good information. There will be new ideas to test in the spring. New fuel mixes and new designs. 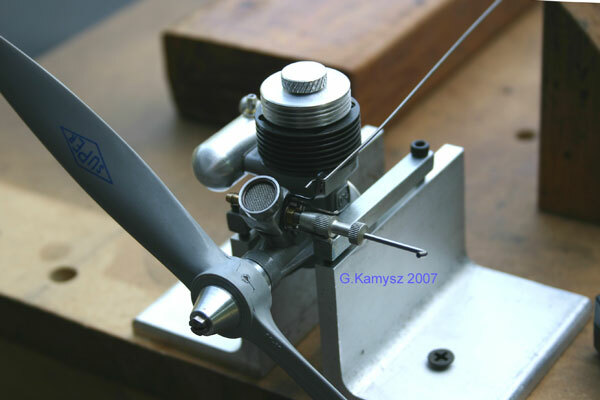 I am thinking about a major update to the main site including basic information about model diesel engines. And, I want to get the forum back up and running shortly. I hope that between work, marriage, and a baby due in April, I’ll still have time to work on engines. I continue to work on the FS-91 conversion. 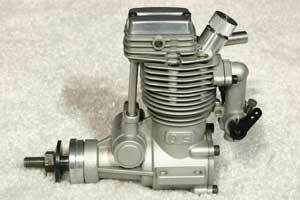 I think that the carb for this size engine is becoming the sticking point. 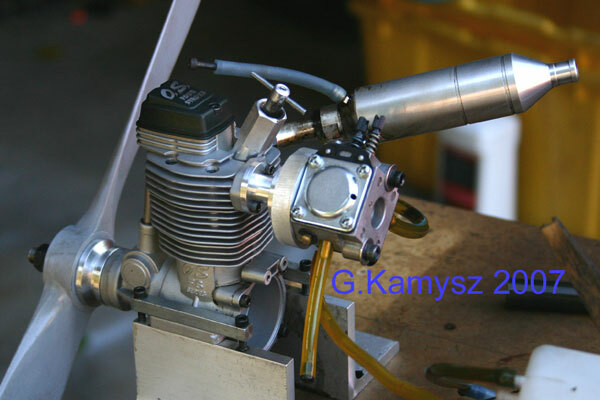 The acceptable air/fuel mixture range is rather narrow and the model carbs lack the proper tuning. Since model diesel fuel, especially without ether, approaches air/fuel ratios of gasoline I decided to try a Walbro carb designed for gasoline fuel. These are common on small portable gasoline engines. A straight manifold was made to adapt it. I spent quite a bit of time trying to get the carb working. There is some conflicting information about setting up the Walbro carburetors on the internet, which me cost some aggravation and time. I have the engine running with the Walbro pumped carb. Some fine tuning and a velocity stack is still necessary. It will be a nice addition with the built in pump and better fuel regulation. A new manifold is also in the works. I look forward to test flying the engine soon. After making a new “lanova” cell I attempted to run the engine. It started and ran but was not happy. I sleeved the throat of the carb, but this did not improve things significantly I was able to get about 6500RPM out of it. The carb needles were very hard to adjust and it wouldn’t run on even standard 35% ether fuel. I had a Rossi slide carb from a car .12 or .15 engine with a smaller bore and made a straight intake manifold to mount it on the engine. After a bit of fiddling with the needles it was running. After several tanks I was able to dial the carb in and managed to get some tachometer readings. The best running seemed to be with very little ether in the fuel, but it still wasn’t the best. I did get ~7400 RPM with a Graupner 16×8 and about 9800 RPM with an APC 13×9. Idle with the 16×8 was an incredible 1800. It would actually run slower but sounded awful as it missed, but kept running. Now to figure out what modifications are needed to the original carb to make it work. There also seems to be an issue of operating temperature variation in this engine. I think I can work it out with proper cowling in the airplane. I got it on the bench today and ran the FS-91 today. I ran into a minor problem with my adjustable compression device and will have to make another. I made a mistake during machining and it failed shortly after the engine warmed up. Everything looks good. A little shop time I’ll give it another try. Photos and tachometer readings will follow. I ran the Norvel .074 Diesel Conversion today. Running the previously mentioned fuel which is 28% castor oil, 35% ether, 35% kerosene, and 2% amyl nitrate, it turned a Graupner 8×4 Super Nylon at approximately 11,000 RPM. Idle was roughly 4500. The engine is getting better with runtime. It has only about one hours total at this time. It was 87°F today in Chicago around noon, so I called it quits for the day. Also visible in the photo is my newly finished engine test stand, made from some 2″x2″x1/4″ aluminum angle. I will add an aluminum base with slots for bolts to adjust for engine widths in the near future. I recently completed a couple Norvel .074 diesel conversions. The head is my own design. The look was intended to keep the rather “Soviet” of the engine. Test running will be under way shortly. Fuel will be Plain Bearing Blend, from Eric Clutton. I have test run the engine with a Graupner 8×4. I’ll get back with some details when they come about. It’s too bad Norvel has gone into the history books. The engine were good, but where more than the typical modeler could handle for running in, due to tolerances in the fits. Patience is needed to get a Norvel broken in properly. I’ve been working on some diesel conversions of four stroke glow engines. I have several successful conversions. The engines start easily and run well. Power is on par with the original glow version or better. The engines run quietly and are tolerant of needle settings. Fuel consumption is typical of diesels. Compression adjustment is accomplished via the glow plug hole by an adjustable volume chamber. The conversion process consists of increasing the compression ratio to what is required by the fuel. I make adjustements to components affected by milling the head and case, like pushrods, pushrod covers, and intake manifold. I also modify the carb slightly to improve fuel draw and throttle response. The “lanova cell” is what we are calling the adjustable compression device is made to suit the engine size. You are currently browsing the Diesel RC weblog archives.